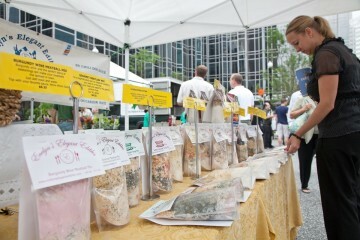 Eat/Drink is NEXTpittsburgh’s weekly roundup of news in the Pittsburgh dining scene. Steel Cactus, the Walnut Street taco/cantina/party joint from AMPD Group (owners of Diesel, Skybar, Local and Ten Penny) will open a second location on the South Side in June. The group’s newest restaurant, Dominic’s Deli & Bottle Shop, opened along Federal Street in a retail space in PNC Park on Monday to coincide with baseball’s marvelous return. Il Tetto, the third-floor rooftop beer garden in the Sienna Mercato complex at 942 Penn Avenue in Downtown is staffing up with plans to open later this month. Il Tetto will offer light fare including pickled vegetables, charcuterie and oysters to go with a substantial beer selection. A retractable glass ceiling will make the space usable year-round. Sienna Mercato’s first-floor restaurant, the meatball-themed Emporio, opened to favorable reviews earlier this year. We finally got around to stopping by the joint last week en route to a concert and were impressed not only with the food, but by the sheer size of the place. Mezzo, the second-floor restaurant, is scheduled to open over the summer. 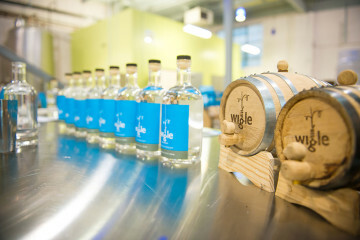 Wigle Whiskey is throwing a party on Thursday to celebrate the release of its first aged Ginever — a Dutch-style gin made from a base of un-aged rye whiskey and infused with organic botanicals. The distillery will host sessions from 6 to 8 p.m. and from 8 to 10 p.m. on Thursday. Tickets remain for only the later session and cost $25 per person. The distillery will also roll out two new small-cask aged wheat whiskey varieties — finished in cherry and maple wood — later this month. Update: Eddie Merlot’s, a 300-seat chain steakhouse found throughout the Midwest will open its tenth and easternmost location at Four Gateway Center on April 22. The space, which formerly held Elements, will feature three private dining rooms and a pair of wine rooms. Dinner service will run from 5 to 10 p.m. Monday through Thursday and 5 to 11 p.m. Friday through Sunday. Lunch service will begin in the restaurant’s second week and run from 11 a.m. to 2 p.m. Need a sure sign of spring? The patio at Kelly’s is open. Kevin Sousa will host No Menu Monday at Bar Marco next week with the proceeds from the evening going to the Make-A-Wish Foundation. Sousa, owner of Station Street Food, Union Pig & Chicken and Superior Motors, is planning a five-course tasting menu with a la carte items available at the bar. Reservations for the dinner seating, which begins at 5 p.m., are required.